Here is a list of French reflexive verbs that describe reciprocal actions: things that two or more people feel or do to each others. What Does French Reciprocal Verb Mean? “Reciprocal” is an adjective, it means “done by both sides to each other” or “felt by both sides about each other”. 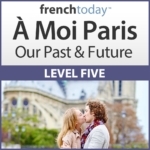 À Moi Paris Level 5 "Our Past and Future"
Reciprocal Verbs are a subcategory of Pronominal/Reflexive Verbs. Let’s take the verb “réveiller” which means to wake up. So how can you tell? Usually from the context of the sentence / story. I suggest you click on this link to understand the French reflexive/pronominal/reciprocal verbs. It’s all explained very clearly in that article so I won’t explain it here again. Can you think of more common French reciprocal verbs? I mean, many verbs could be used in a reciprocal form: you could imagine a situation where my daughter and I are brushing each other’s hair…. but it’s not common. So here, I’m looking to list for some French verbs that are usually used in the reciprocal form. Please leave them in the comment section below and I’ll add them to this French reciprocal verbs list. 1) (s’adorer) Mon mari et moi, nous _______________. Mon mari et moi, nous nous adorons. My husband and I, we love each other. 2) (s’aimer) Ils _______________ comme au premier jour. Ils s’aiment comme au premier jour. They love each other like they did the first day. 3) (s’appeler) On _______________ ce soir pour le cinéma ? On s’appelle ce soir pour le cinéma ? We call each other tonight for the movie? 4) (se battre) Mais vous _______________ sans arrêt ! Mais vous vous battez sans arrêt ! But you fight each other all the time ! 5) (se comprendre) Toi et moi _______________ sans nous parler. Toi et moi nous comprenons sans nous parler. You and I understand each other without talking. 6) (se connaître) Sylvain et toi, vous _______________depuis la semaine dernière ? Sylvain et toi, vous vous connaissez depuis la semaine dernière ? Sylvain and you know each other since last week ? 7) (se détester) Paul et Nathalie _______________ depuis le lycée. Paul et Nathalie se détestent depuis le lycée. Paul and Nathalie hate each other since High School. 8) (se dire) Ma sœur et moi _______________ tout. Ma sœur et moi, nous nous disons tout. My sister and I, we tell each other everything. 9) (se disputer) Ils _______________souvent à cause de cela. Ils se disputent souvent à cause de cela. They often argue because of that. 10) (se parler) Vous vous parlez souvent. You talk to each other often. 11) (s’embrasser) Ils _______________ dans le parc. Ils s’embrassent dans le parc. They kiss (each other) in the park. 12) (s’énerver) On ______________ facilement. We get on each other’s nerve easily. 13) (s’expliquer) Ils _______________ sur le terrain de tennis. Ils s’expliquent sur le terrain de tennis. They find a solution to their argument on the tennis court. 14) (se quitter) Nous _______________ à Paris. Nous nous quittons à Paris. We leave each other in Paris. 15) (se regarder) Les chats _______________ à travers la fenêtre. Les chats se regardent dans le miroir . The cats are looking at each other through the window. 16) (se rencontrer) Mon mari et moi, _________________chez des amis. Mon mari et moi, nous nous sommes rencontrés chez des amis. My husband and I met at a friend’s house. 17) (se retrouver) On _______________ au café à 14 heures. On se retrouve au café à 14 heures. We meet each other at the coffee house at 2PM. 18) (se sourire) Vous _______________ tous les jours. Vous vous souriez tous les jours. You smile at each other everyday. 19) (se téléphoner) Ces deux amies _______________tous les week-ends. Ces deux amies se téléphonent tous les week-ends. These two friends call each other every weekend. 20) (se voir) Nous _______________ce soir au théâtre. Nous nous voyons ce soir au théâtre. We see each other tonight at the theater. With reflexive verbs, you HAVE to use the reflexive pronoun, the second pronoun. But you don’t have to use a subject pronoun… You can use a noun, or in this case stress pronouns (moi, toi…) because of the “et”. I could also have said: toi et moi, nous nous comprenons sans nous parler. And it’s more common because it kinds of sound better. I could also have said: Sylvain et toi vous connaissez depuis la semaine dernière ? I’m sure “Michel et Anne se comprennent sans se parler” sounds OK to you. Structure wise though, it’s exactly the same thing. You and I get each other. You and I, we get each other.